Each of our Big Ten writers was asked to pick a Big Ten football "person of the year" for the 2015 season. Today on the Big Ten blog, each writer will lay out the case for his choice. America loves a good comeback story. The once washed-up actor who turns in an Oscar-caliber performance. The politician who overcomes a scandal. The athlete who battled injuries. They all make for irresistible plot lines. But that kind of revival isn't supposed to be possible for longtime college football coaches. Their tenures are too short, their fan bases too impatient. Once the downward spiral begins, it's almost never reversible, as athletic directors and donors fear losing recruits, revenue and "momentum." Certainly no one would expect a booming career renaissance from a 60-year-old coach, one who'd been at the same school since before the new milliennium and who carried a reputation for being conservative, if not outdated. Yet that's exactly what Kirk Ferentz achieved at Iowa in one of the more remarkable one-year turnarounds in recent memory. All the way up until this season's opener and perhaps a little beyond, nothing but negative talk surrounded Ferentz's status. The Hawkeyes finished just 7-6 the previous season despite a dream schedule and got drubbed by Tennessee in their bowl game. Iowa had gone 34-30 in the five years since the 2009 Orange Bowl season. Ferentz's enormous contract and unwieldy buyout were the only national talking point about the program. Season-ticket sales were cratering as fans grew tired of the mediocrity. It looked like 2015 could get ugly if the team got off to a slow start. Ferentz, though, used the offseason to reinvent, or more accurately, renovate his way of doing things. He made the bold decision after the bowl game to elevate C.J. Beathard to first-string quarterback over a two-year starter in Jake Rudock. He changed the team's practice routines, giving players Thursdays off. He accepted a little bit more freewheeling style of play, at least by Iowa's normally buttoned-down standards, by giving Beathard license to use his athleticism, by faking punts and going for it on fourth downs. 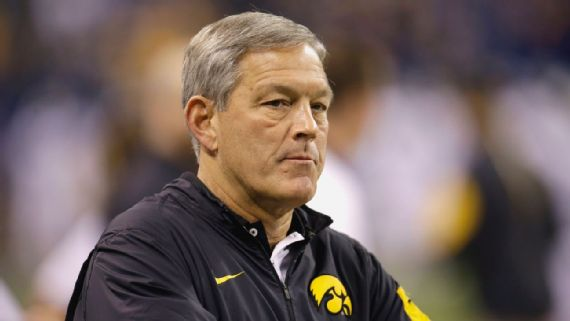 Ferentz drew laughs in September by joking to the media that "It's a new me." He really hadn't changed much. One of the coach's greatest strengths is his unflappability and consistent demeanor. He might have grown up in Pennsylvania but is now as much an Iowan as anybody, having spent 26 years at the school including an earlier stint as an assistant. The Hawkeyes still lined up with fullbacks and tight ends and embraced old-school Big Ten values. But from Week 1 on, there was clearly something different about this Iowa team. It played with confidence. With fun, even. And it kept winning games, week after week. The punditry dismissed the Hawkeyes as a product of another soft schedule and fans waited for them to go away. Yet they continued to win and climb the College Football Playoff rankings until they were 12-0 and No. 4 in the country heading into the Big Ten title game. Even in a bitter, hard-fought defeat to Michigan State, Iowa earned begrudging respect from some of its most serious doubters. In his 17th season as head coach, Ferentz managed to scale new heights. Iowa recorded its first 12-win season. It reached the Rose Bowl for the first time since 1991. The Hawkeyes fell flat on their faces in Pasadena against Stanford, but that couldn't take away from all they'd accomplished. Ferentz understandably won the Big Ten coach of the year honors for the fourth time in his career and took home three national coach of the year trophies as well. In an era when schools rush to fire coaches after one or two bad seasons to chase after the new hot name, Ferentz and 2015 Iowa counteroffered a testament to patience, stability and experience. This season will be worth remembering the next time a fan base is howling to get rid of someone in the midst of a downturn. After all, there's nothing like a great comeback story, and Ferentz showed that even an old football coach can author an inspiring one. That's why he is the easy choice as the Big Ten person of the year.